The Alienware Aurora R5 is a revolutionary gaming desktop that puts other pre-built PCs to shame with a smaller, clever chassis and surprisingly affordable price. 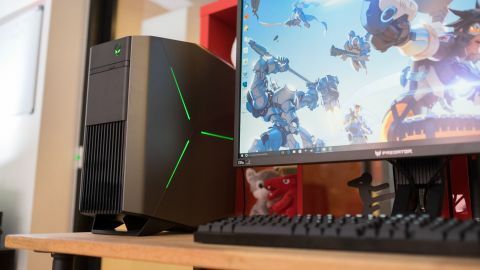 Over the last 20 years, Alienware has carved a huge name for itself in the computing world with a long list of the best gaming PCs, and perhaps one of the most noteworthy has been its mid-size tower, the Aurora. We’d been waiting for the follow up to the Aurora R4 and its maneuverable fans since it was released way back in 2011. Now the wait is over. When we finally got our hands on the Alienware Aurora R5, it was a leaner, meaner and even more extraordinary gaming rig than the then-new Alienware Area 51. The Aurora R5 is looks the part of a tower of power, but it's surprisingly tiny despite its dominating silhouette. Measuring about 1.5 feet tall and just over a foot in depth, it's a far smaller system than your traditional mid-tower case and almost veers into Mini ITX territory. The next thing you’ll notice is just how sleek the Aurora R5 is. There are no flat edges on any side of the case. Instead, they all slide off at odd angles, and even the computers two feet are sloped at different angles. That might all seem random, but it results in a beautifully modern aesthetic. Alienware's designs have classically exuded an exotically extraterrestrial quality to them. However, the Aurora is more industrial and seems more like something from our own future rather than an alien pod, like the Area 51. Ultimately, though, there haven't been many gaming PCs with a uniquely asymmetrical design like this before. Some elements of Alienware's older designs also bleed through here, including the side panels that bend at the corners, like the company's gaming laptops. You'll also find that signature glowing alien head and tri-beam accent lights on the sides, all of which are customizable through the Alienware FX software. Curiously, one element that's missing here is the center spine, which has been a part of almost every Alienware design since the Area 51 Predator 1. Instead of a wedge shape at the front end, the R5's façade is flat and almost completely plain, save for the glowing logo, an extremely thin disc tray and ventilated front intake. One welcome new design element is a rear handle that makes lugging around the system a lot easier. Most gaming PCs come with a top- or bottom-mounted power supply. However, the R5 comes with one that's turned on its side and attached to an articulating arm that swings out of the case and closes over the motherboard. It's a literally head-turning design that helps reduce the height of the PC while using up the empty space over the processor and CPU cooler, which is otherwise unoccupied on almost all other desktops. The power supply assembly doesn't interfere with other components, like crushing the memory modules. The folding arm is also designed to just glide over the graphics cards, and it has a small nook for cables to run through and a space cut into it to prevent the side panel from clamping down on them. It's a big upgrade from the usual CPU fan cooler, though it partially blows hot air directly into the rear handle. This means a portion of the heat travels a few inches before smacking into a solid plastic panel. Don’t let the Aurora R5’s size fool you – it’s a full-fledged gaming desktop and can even be VR ready, depending on your configuration. It starts out around $799 (about £599, AU$1071), and that base configuration will net you a 6th-generation Intel Core i3 CPU, Nvidia GTX 950 GPU, 8GB of RAM and a 1TB hard drive. In reality, though, you can't really play many demanding games with this starting spec. So, you'll likely have to step up to the $1,099 (about £825, AU$1,473) Intel Core i5 and Nvidia GTX 970 configuration, if you want a smooth, say, Overwatch experience. Even at this price point, the Aurora R5 is more affordable than the Lenovo Ideacenter Y900 and Acer Predator G6 – with cheaper upgrades to boot. Unfortunately, you won’t be able to find a new Alienware Aurora R5 on store shelves, but we would still heartily recommend checking out the Alienware Aurora R7. With the higher-end power supply, we went ahead and plugged in a second GTX 1080 for our enjoyment … err, we mean, testing. The system ran like a dream with the second card and it really is impressive how you can upgrade the Aurora despite its limited chassis. Of course, there's the option of upgrading your system even more ways, and Alienware has made the entire process tool-less. You won't even have to contend with thumbscrews to remove the expansion slots, and there's room for two SSDs to slide in on tool-less trays as well. With Nvidia's latest and hottest Pascal GTX 1080 graphics card and an Intel Core i7-6700 CPU on board, the Aurora R5 tore up all the benchmark tests I put it through. It easily put up some of the best scores I've seen from a gaming machine, and it even put the overpowered Maingear Shift to shame in certain respects. With a single GPU, the R5 was able to play GTA V at 78fps on Ultra, whereas the Shift achieved a 73fps performance with two Nvidia GTX 980 Ti cards. Pascal offers so much more performance than Maxwell, it easily outpaces every Nvidia-powered gaming desktop we've reviewed in the past. While Alienware's systems have a reputation of being exorbitantly expensive, the Aurora R5 is approachable at $1,099 (about £825, AU$1,473) for a decent configuration – more affordable than some of its competitors. From there, you could upgrade the components yourself through a painless and tool-less DIY process.